Jewel Bling! is a gaming app that requires the player to think both strategically and logically. It was developed by GameOn, costs $0.99, and is compatible with an iPhone, iPod Touch, and iPad. There is a lite version offered for free. Jewel Bling! is split into 3 sections: Easy, Normal, and Hard. 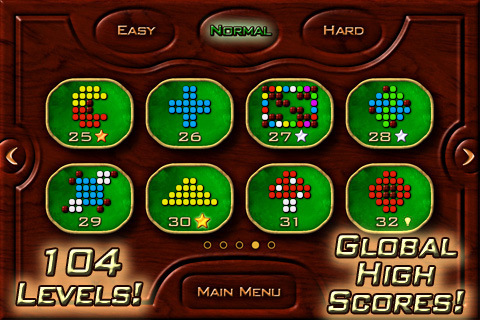 In each mode there are 40 levels to complete. The basic game play includes a wooden grid backdrop and boxes that are colored or wood. Then a number of colored Tetris shapes are dropped onto the board and it is up to you to unscramble and arrange them in agreement with their shape and color. Generally there are only two colors on the board at a time. Once you have moved the shapes around so that no colored square is left uncovered and no wooden square has a shape blocking it, the shapes start sparkling and mold together into one large shape. Each of your moves is kept track of and you get a rating once you have finished the puzzle based on how many moves it took you to get the job done. You get a number of tools to help you complete each puzzle including a map that shows you what the shape is supposed to look like when completed, an Undo button, and a Hint button. If you do decide you need to use the Hint button, the map on the right side of the screen lights up with where one of the shapes goes in relation to the whole. The Hint button also tacks on an extra 10 moves to your total so you want to use it sparingly. Each level completed unlocks the level above it. If you want to give up and go to the next level, you can hit the Solve button for the computer to put the pieces together of the current level you are working. In the Options section you get your game stats, settings, and high scores. Jewel Bling! was one of those games that I was fanatical about when I first started playing and I have since gotten bored with. The game is definitely not boring, but you are given so many cheating options that you do not end up doing all the work and the challenge aspect (that keeps you coming back for more) is taken out. AppSafari review of Jewel Bling! 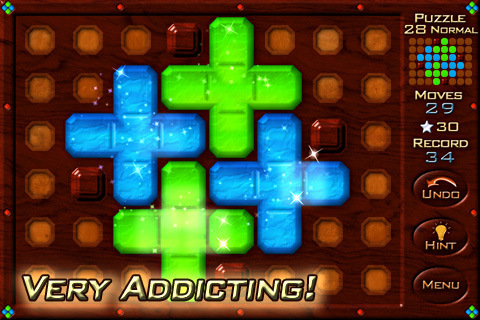 was written by Vanessa Paszterko on November 21st, 2010 and categorized under App Store, Fun, Games, Puzzler, Strategy. Page viewed 3124 times, 1 so far today. Need help on using these apps? Please read the Help Page.